Available in 1.5, 2.0, or 2.5 ohm (+/- .2) resistance. These adjustable replacement bottom dual coil heads are compatible with the Smok Micro Core ADC II Clearomizer. These coils are also compatible with Smok's GDC and TDC series of clearomizers, as well as the Smok eGo Cloud tank. What makes these coils truly unique is that they allow you to adjust the flow of e-liquid to the coil by twisting the liquid intake hole cover up or down - this gives these coils versatility in getting the very best out of your thinner PG or thicker VG based juices! Please note that even on the most restrictive setting, the e-juice holes on the adjustable Micro Core coils are slightly larger than those on their standard counterpart. These coils ensure a nice, clean flavor from your e-liquid and also reduce wicking issues. After re-filling, screw the bottom cap with your newly installed coil head back onto the body of the clearomizer and allow a few minutes for the e-liquid to soak the new coil. Screw onto your device and you are ready to vape! Last longer than wicked coils and have a much cleaner tasting vape. Recommend these! Hard to find in stock went to four websites before ordering from smoktech. They were out of stock on the 1.5 ohm went with the 2.0 ohm instead works just as well just had to dial the wattage up on the battery a little bit. Q: Thoughts on if these will work for a Vaporfi Rebel II? My current atomizers have adjustable juice flow and are stamped "M Core-A DC 2.5". Thanks! The images for the Vaporfi Rebel II atomizer look very similar to the Smok Micro Core ADC II replacement coils; however, I could not find anything that would confirm or deny that the Smok Micro Core ADC II replacement coils are compatible with the Vaporfi Rebel II. Q: Will these work w/the clearomizer that comes inclusive w/the EGOII 2200 mAh Kit? Having troubles finding the correct replacement. These replacement coils are designed specifically for the Smok Micro Core ADC II Dual Coil Clearomizer, so they won't work with the clearomizer that comes in the EGO II 2200mAh kit. Q: How are these different from the standard replacement dual coil. How is it adjustable? I'm glad to help here! What makes these coils truly unique is that they allow you to adjust the flow of e-liquid to the coil by twisting the hole cover up or down - this gives these coils versatility in getting the very best out of your thinner PG or thicker VG based juices! Please note that even on the most restrictive setting, the e-juice holes on the adjustable Micro Core coils are slightly larger than those on their standard counterpart. Q: Do you carry the micro core adjustable coils for the smoktech gdc 1.5 ohms? I'm glad to help here! 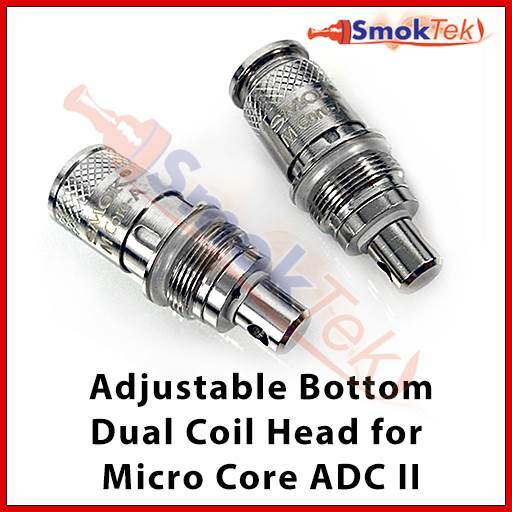 The Adjustable Replacement Bottom Dual Coil Head for Micro Core ADC II is also compatible with the Smok GDC clearomizer. Q: Hi, I have a SMOK Micro ADC tank not the II? I am looking for coils to fit this. I have iStick 30W and I also have an EVOD 900 MAH. I would probably be using this mostly on the EVOD battery. I would like the best vapor production, throat hit, and taste. Not sure which resistance is best? I use a mixture of liquids from high to low VG. I appreciate any information, as I have this lovely tank but cannot find coils at any of my local vape shops. Thank you, T.
I'm glad to help here! These coils should work great for you SMOK Micro ADC. Both he 2.0 ohm and the 2.5 ohm will work great on your iStick 30W device. On the EVOD 900mAh battery, though, the 2.0 ohm Adjustable Replacement Bottom Dual Coil Head will provide a warmer vape with more vapor production. Conversely, the 2.5 ohm replacement coil head will provide a cooler vape with less vapor production. 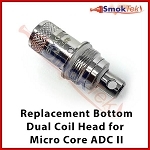 Q: Smok Micro Core-A Adjustable Hole Dual Coil Head Micro M-Series Have these replacement coils been discontinued? If so, is there a similar product that is compatible with my KangerTech ProTank 3 ? Thank you for reaching out to us! The Adjustable Replacement Bottom Dual Coil Head for Micro Core ADC II has been discontinued, but we do have the Upgraded Replacement Dual Coil Head for the Kanger ProTank-3, and I'm posting the link below. Q: What replaces Adjustable Replacement Bottom Dual Coil Head for Micro Core ADC II for the Micro Core RDC Glossy Clearomizers that I have? Thank you for reaching out to us! At this time, we do not carry a replacement coil head that is compatible with the Micro Core RDC Glossy Clearomizer. The manufacturer has made these replacement coils very difficult to obtain. Q: Will this atomizer work w/ the VaporFi Rebel II? Q: Hi. I would like to order 10 of these replacement coils but I cannot change it from 2.5 (which is currently unavailable) to 2.0 like I ordered in December. Is there a alternative that I can use for my micro ADC tank? I am not fluent in "vape" but if you have questions I am hopeful that I can offer you a coherent reply.